Horrific discovery of live bees in woman’s eye : Healthcare Asia Daily News | Asia's Leading News and Information Source on Healthcare and Medical Industry, Medical Technology, Healthcare Business and R&D, Healthcare Events. Online since 2010. He, a 29 year-old Taiwanese woman, was tending to a family member’s grave on tomb-sweeping day when she felt something enter her eye. Suspecting soil, she washed it out with water, but by night felt a sharp stinging pain under her eyelid, which had begun to water profusely and swell. Doctors successfully extracted all four sweat bees alive in a “world first” incident of its kind. He had saved her eyesight, and the lives of the bees, just by not rubbing her eyes – the venom would have blinded her if released. “Sweat bees”of the Halictidae family are found all over the world, commonly nesting in the mountains and near graves. 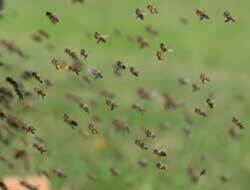 The small bees are attracted to human perspiration but are not usually aggressive, stinging only if provoked.